The next demonstration employs a volatility band breakout system that enters on the open today, following a penetration of yesterday’s close. Again - for the sake of clarity, only a single JY trade is examined. Parent account setup ($500M) began on October 18, 2004, and is completed on the following trading day – Oct 19 (creating orders for the 20th). Next, the Child account ($5M) is created and scaled to the Parent. When the Default Orders tab is selected, we can see that a signal is received that same evening to be executed on the open of the 20th, and a Long Entry (LE) order is generated. The only difference in the Parent and Child is the number of contracts; The theoretically perfect Parent indicates a size of 2,183 contracts, while the Child account (bottom window) – which has been scaled to the parent – indicates a position size of 22 contracts. 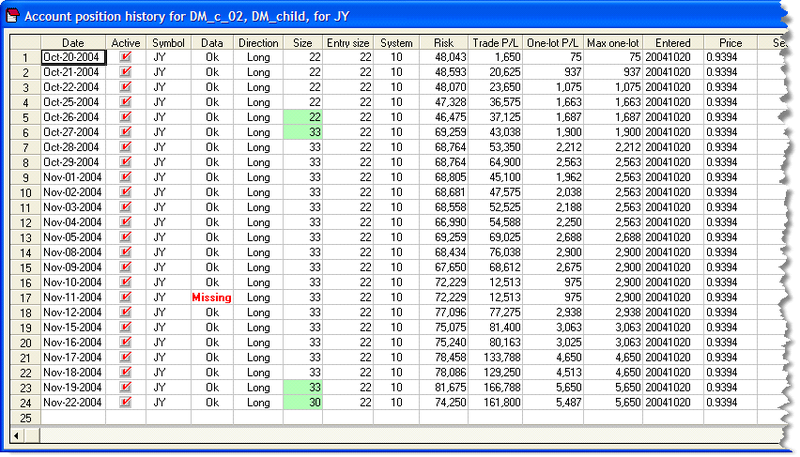 When the system is run forward to the next trading day, the Positions window for the Child account reflects this size adjustment, showing both the original position size at entry (22 contracts), and the 33 contracts currently held as a result of the increase in account value. Note the Missing alert in the Data column, on Nov 11, 2004. This was a US holiday (Veteran’s Day), and the financial markets were closed. Mechanica internally organizes and tracks various Category and Category-related risk information utilized in Initial Sizing and Resize operations, independent of fluctuations in Child account size due to additions / withdrawals.